While supplements and meal-replacement shakes aren't required for weight-loss success, you may find them helpful if you're not an experienced dieter. Two meal replacement shake options are GNC's Lean Shake and Medifast's diet shakes. While similar in nutritional profile, you may find one to be significantly better based on your nutritional needs and preferences. Consult a doctor before trying any supplements or using meal-replacement shakes. To lose weight, you need to consume fewer calories than you burn each day. This means it's better to eat low-calorie foods. Medifast shakes are lower in calories than the GNC Lean Shakes, as the former provide 110 calories and the latter contain 180. If you drink two shakes daily, switching from Lean Shake to the Medifast shake would save you 980 calories each week, enough to lose more than 1/4 lb. without otherwise altering your diet. Medifast and Lean Shake don't differ greatly in fat content, as the former contains 1 g per shake while the latter provides 2 g. Medifast shakes contain no saturated fat, while Lean Shake provides 0.5 g. While low-fat shakes can be beneficial because a low fat content limits the calorie content, you shouldn't shun fat when dieting, as it does promote satiety and helps your body absorb vitamins. Maximizing nutrient absorption is important when you're on a reduced-calorie meal plan. If you're on a low-carbohydrate diet, Medifast shakes would be preferable, as each contains 13 g carbohydrate, while the GNC Lean Shake contains 30 g. According to research published in the March 2010 edition of "Nutrition & Metabolism," low-carbohydrate diets can accelerate fat loss and help you preserve strength when dieting. Fiber is a crucial nutrient your body needs for optimal health, as it can help control blood sugar and cholesterol levels and promote a healthy digestive system. Fiber also aids in dieting because it promotes satiety. GNC Lean Shake is higher in fiber, with 8 g, which is twice the amount of fiber in Medifast shakes. 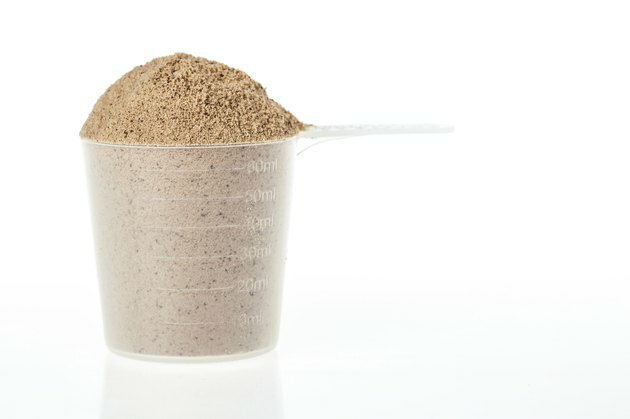 Protein is often associated with muscle building, but it is also important for dieting; research from the May 2008 issue of "The American Journal of Clinical Nutrition" notes that it triggers more satiety and calorie-burning than other nutrients. Medifast shakes are a better source of protein with 14 g, while GNC Lean Shakes provide 9 g.
Both GNC Lean Shakes and Medifast shakes are rich in vitamins and minerals, helping to provide nutrients you're not getting from the meals you're replacing. The products provide similar levels of vitamins and minerals and both are rich in calcium, which may promote weight loss according to the June 2011 issue of "Nutrition Reviews."